On a recent trip up Dorset, Vermont, Kaki noticed that the sidewalks are paved with Vermont white marble. Mark visited the polder landscape of northwest Germany (Friesland) near the North Sea, which is very similar to the Dutch landscape of farm fields and windmills, all below sea level. 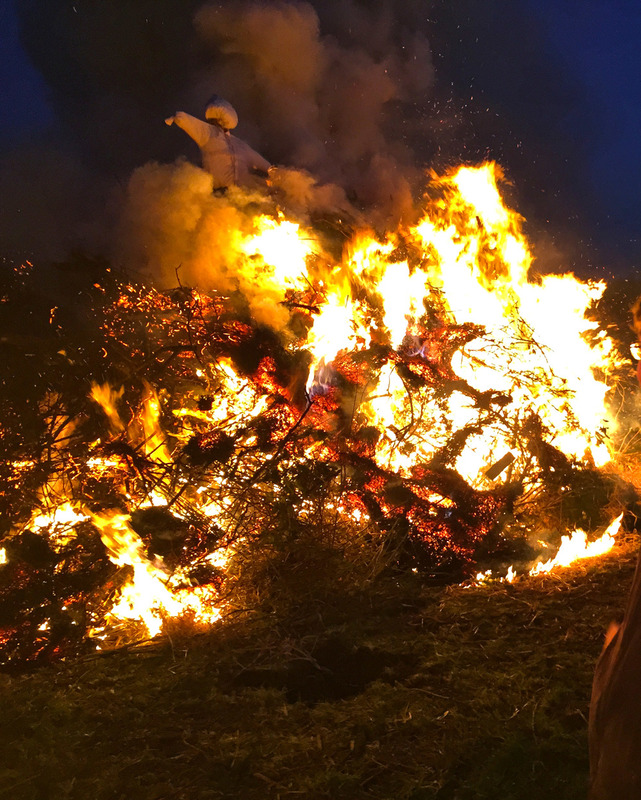 On Easter-eve he joined family friends for their annual bonfire that burns away the winter cold and brush cleared from the fields, to usher in spring. This amazing German tradition is widely celebrated, and fires were visible in every direction from our spot on the Pfahldeich (pile-dike, built in the 1600s). It’s spring and Mary’s chickens are in heavy production! Today was the first distribution day at KMDG. Mark recently led a trip of architecture students from Wentworth to LA. Above are a couple of images from his trip. Click to see their expanded view and descriptions. These are a few of the images from Mark's recent trip to Spain. Click on any of them to see their expanded view and description. Panorama of the White Mountains from Zeacliff summit. The windchill was -75 on Mt. Washington (on the left of the photo). This was taken by Michael on his recent winter excursion. Mosaic paving is used in towns across the Azores on sidewalks and plazas. The black stones are native to the islands, and islanders exchanged them for the white stones from mainland Portugal. Here at 214 Cambridge St. there are an abundance of spectacular sunsets. Above are our favorites from the past year. The starting point of the deck spine floating above the steep rocky Maine coast. View to the dining hall - perfect, simple jointing! The view from Kaki's forge: across the hammers through the foundry window to the Spruces. What a view - from the top of the iconic Haystack stair connecting the studio spaces to the sleeping cabins. Images from Kaki's summer workshop at the Haystack Mountain School of Crafts. Fall color in the fields—young scarlet oaks and Donald Wyman crabapples. The nursery is experimenting with training different species, like these river birches, into espalier. Espaliered trident maples against a sunny wall at the nursery office. Regal Prince oaks trained into an arch at the parking area. Sharon spent a beautiful morning tagging trees at Ruppert Nurseries in Laytonsville, MD. Cows in a green pond. On the way to Summer Star Wildlife Sanctuary in Boylston, MA, Kaki couldn't pass by this scene without taking a picture. Orange trees in stone dust in Fez; made me think of the oaks soon to be planted on the picnic terrace at Fisher Hill! Storks nesting in the ruins at Chellah in Rabat. The public garden in Fez, an incredible oasis of green after the dense, packed passageways of the old medina. Halprin's Fountain 44 years later. The contrast between the water stained and the weathered concrete was quite striking. It's too bad the water wasn't on. Jared's photo from Keller Fountain Park in Portland, Oregon. Kaki’s shot of the orchard meadow at Sissinghurt Castle from the top of the prospect tower. Now THAT’S a hedge! The original green architecture. Photo by Kaki at Sissinghurst Castle Garden.